Quintana Roo, one of three states forming Mexico’s Yucatan Peninsula, is renown for its spectacular white sand beaches, turquoise water and Mayan ruins, quite an accomplishment for a land that not long ago was still regarded as an inaccessible, primitive and forgotten territory inhabited by outlaw chicleros. In the past twenty years, another world, equally spectacular, lying beneath the jungle floor, has begun to come to light. Marked by giant caverns, complex subterranean passageways, and intricate decorations, this intricate world was carved out of a thick layer of limestone by a filtering solution of rainwater and carbon dioxide (carbonic acid). Severe climatic changes 18,000 years ago led to a change in ocean level; the significant rise in water levels that ensued flooded and sealed this underground landscape. 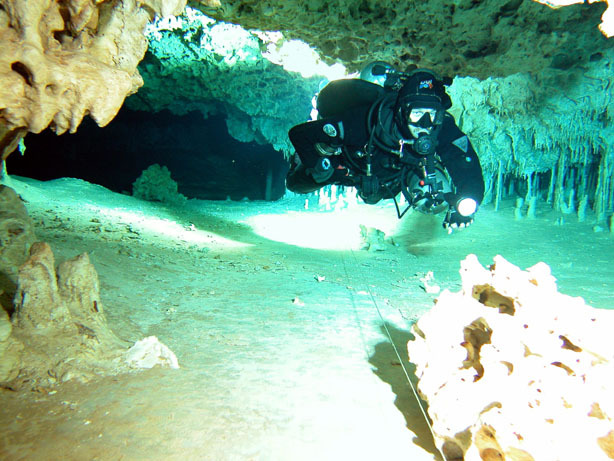 Today, Quintana Roo has eighty-two explored and surveyed underwater cave systems. Most of these are concentrated in a tight perimeter around localities such as Tulum, Akumal and Puerto Aventuras. In fact, four of the largest, Ox Bel Ha, Nohoch Nah Chich, Dos Ojos and Najanral, lie within a 30-mile radius. The general layouts of area cave systems are quite similar; conduits run northwest (upstream) to southeast (downstream), conducting water through numerous bedding fractures to the Caribbean Sea. Individually, however, these cave systems, despite their similarities, are worlds of their own, marked by distinctive geologic formations and hydrologic particularities. 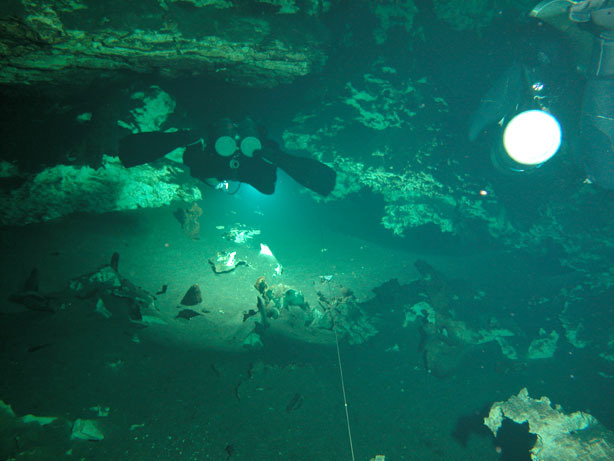 Nonetheless, one underwater cave system here stands out in the manner in which it brings together many of the diverse elements and characteristics that distinguish other area cave systems. This is Ox Bel Ha, Mayan for “Three Paths of Water.” Nested south of the Mayan town of Tulum, and north of the Sian’ Kaan Biosphere, Ox Bel Ha lies beneath an enormous stretch of land that belongs in part to Ejido Pino Suarez and in part to Ejido Tulum. There are several reasons why exploration of this cave system did not begin until the spring of 1998. From where it is most easily accessible, a side road, the cave is marked by a group of small, complex and unattractive tunnels. This alone was enough to turn away the less determined cave diver, especially since there were a number of highly decorated cave systems under active exploration at the time. In comparison to these other systems, Ox Bel Ha seemed to be a bleak prospect. Potentially more promising cenotes that would grant entrance into the cave system were situated much further inland, and access to these is both extremely difficult and logistically challenging. Despite these reasons, exploration finally began. Ox Bel Ha is a classic example of a coastal cave. Its main feature is a higher fresh water layer flowing on top of a near-static salt-water layer, one that intrudes from the nearby Caribbean Sea. This creates a halocline, or a mixing zone, between unequal water densities. 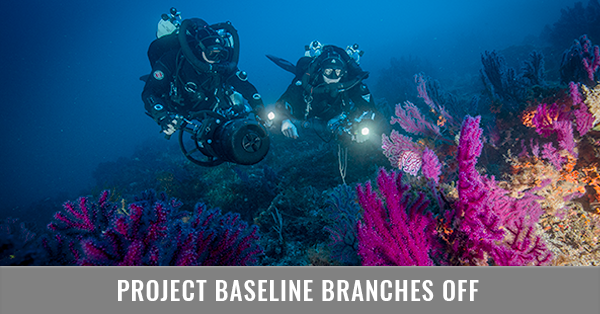 The halocline can be found at different depths; depths gradually increase as the distance to the ocean increases. For this reason, fresh water layers will be thicker inland where the salt water is less intrusive. 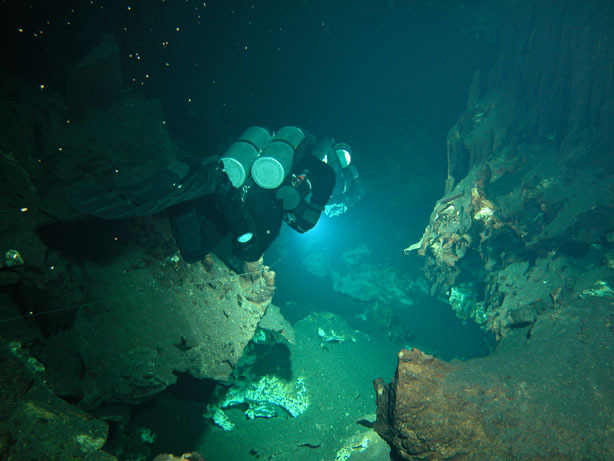 In Ox Bel Ha, the halocline can be found anywhere between 25 feet and 50 feet deep. 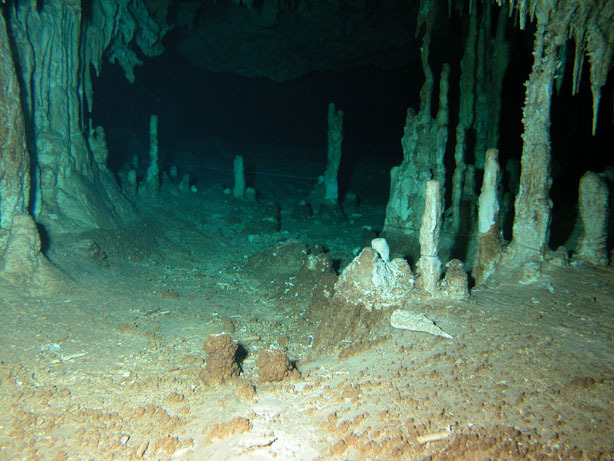 A change in water level due to daily tidal change is visually apparent in the numerous cenotes. 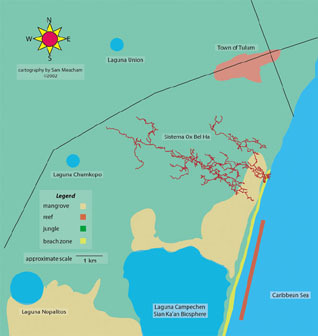 In reality, however, only a few of the area cave systems connect directly with the Caribbean Sea. Many empty into mangrove beds and wetland “savannah,” others in calettas (small bays), and still others eventually reach the ocean, but only through a myriad of small voids in the limestone bedrock. Ox Bel Ha’s downstream runs under marshy land, but continues its course below the beach line where part of the aquifer empties onto the coral reef via three distinct vents. 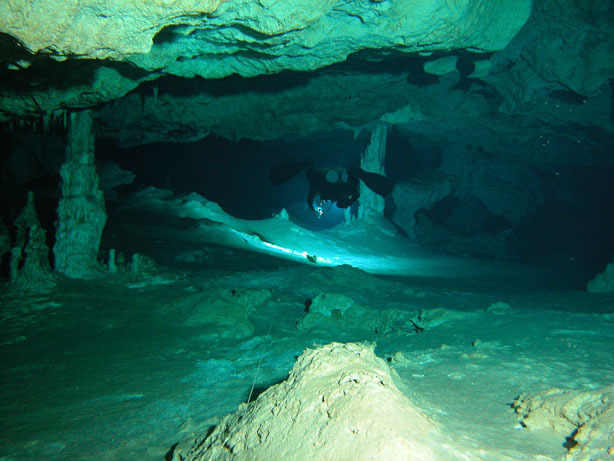 In Ox Bel Ha, the low flow that commonly characterizes the caves in this side of the Yucatan intensifies enormously as the fresh water nears its oceanic destination. During the rainy season, there is a noticeable increase in outflow. For the rest of the year, it seems that, even during long dry spells, water flow intensity remains constant. Fresh water exits with so much force at Ox Bel Ha that salt-water intrusion never gets deeper than 10 feet. At 10 feet, salt and fresh water mix in the most disorganized fashion until they reach the surface of the ocean. Infrequently, an influx of salt water will occur, generating poor water visibility from the disturbed sand particles. This is generally caused by changes in tide or severe weather conditions, and was recently observed during the fallout from Hurricane Isidore. The 96.5 kilometers (60.3 miles) of explored and surveyed passages in Ox Bel Ha represent the greatest variety of cave in the area. This is hardly surprising considering that Ox Bel Ha lies under a terrain that plays host to a multiplicity of diverse ecosystems. Both above the ground and underground, this domain boasts an exciting collection of natural phenomena, ranging from 550 species of bird, 182 species of reptile and amphibian (of which 14% are endemic), 103 species of mammal, 800 plant species, 112 species of orchid and, finally, 38 stygobitic species (of which 36 are crustacean and two are fish). Ox Bel Ha extends beneath several pristine environments such as the Mesoamerican Barrier Reef, mangroves and salt marshes, saw grass and jungle. As it makes its way inland beneath these distinct terrains, its features change. Speleothems become more abundant; passages become increasingly whiter, larger and more defined. 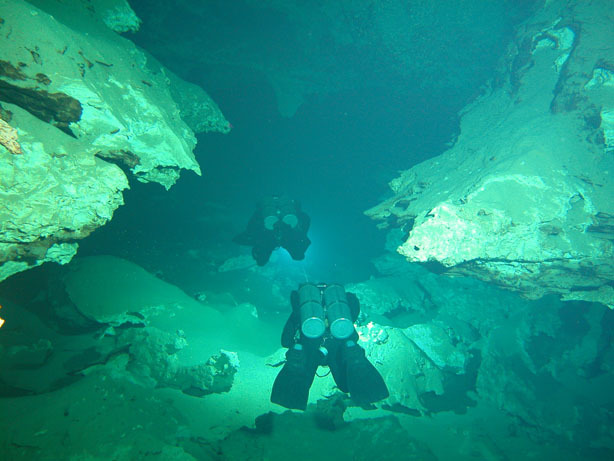 There are fifty-six cenotes that are connected to this cave system. The distant Laguna Campechen, Napalitos, Chumkopo and Union are key elements that, more than likely, influence the general disposition of the cave. Prior to exploration, no one could have imagined the potential of this system and how it fit, like a piece of a gigantic jigsaw puzzle, into the mysterious topography of the Mayan underworld. The future exploration of Ox Bel Ha will give us further insight into the area’s complexities, providing invaluable information for our generation and future generations alike. 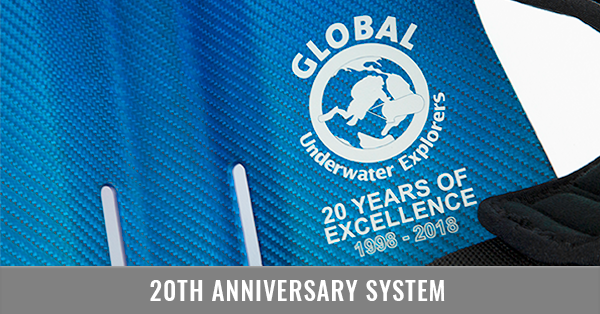 Copyright ©2003 Global Underwater Explorers.